Dates : Arrival in Budapest 27th July, before 5 pm, departure 7th Ausgust . AMFH, Association Musicale Franco Hongroise. - Isabelle Oehmichen, concert pianist, Cziffra Prize, teacher of piano and chamber music in Paris. 1936 - 2011), conductor and founder of the Chamber Orchestra of Hungary, ex-director and professor of chamber music at the Franz Liszt Academy. Concert of chamber music given by the professors of the Academy, free to students and listeners. - Akos Pasztor, solo cellist, professor of chamber music at the Franz Liszt Academy in Budapest. - Annamaria Schmiedt, soprano soloist, and professor of singing in Budapest. - Others professors of the Franz Liszt Academy, soloists on various instruments, are invited also each year. The purpose of the course is to allow adult amateurs access to very high standard chamber music tuition, in small groups in a warm, friendly, cultural environment. There is no age limit. Students will receive a minimum of eight chamber music master classes, as well as additional rehearsal time. The instrumentalists are placed in programmes in advance according to their levels of ability and personal tastes. They receive a proposal of two programmes (one or two mouvements of a work each) in two different styles, these programmes having already been studied (sight-read) prior to the course. It is also possible to register for the cours as a listener (music-lover or relative of the student) with the entitlement to enjoy all the programmes of the Summer Academy. -Only the students an the listeners vill receive a badge of access to the Academy. - The classes are held at the High academy of Budapest (Nagymezo utca, 1, 1065, Budapest, near to the Opera) where the students will enjoy the benefit of excellent facilities for their personnal work. Many of the studios, most with a grand piano, are available to students from 9.0 am to 6.0 pm. 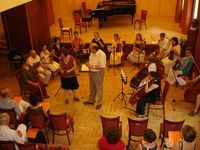 Less advanced students can be accepted into particula class, and accompanied in the concert by a professional, for a supplément of 15 euros per class. Students may stay in nearby city center hotels or appartments which offer us preferential rates. We can hep and advise you in accordance with your wishes and your budget. Your accomodation could be a bed and breakfast, youth hostel or a 5 stars hotel. followed by the distribution of complete files and access badges for the conservatory (arrange to arrive in Budapest during the afternoon). Courses begin the morning of 28th July, 2016. Opening evening: this evening event is included in the course for students and listeners. Dinner-cruise on the Danube, preceded by an on-deck apéritif. departure from 7 August, 2016. - Various concerts within our Academy (included in the cost of the course). - Traditionnal Hungarian evening in a restaurant. - Relaxation therapy workshop for (combating) stage fright and (helping) concentration. - Organization of cultural visits. - ‘Gellert Baths’ and all the thermal baths. - A number of reasonably-priced restaurants.. Registration fee: 15 euros upon joining the association Musical Franco-Hongroise, for listeners and students. - a minimum of eight master-classes. - opening-evening cruise dinner and aperetif. - provision of rehearsal studio, with grand piano from 9.0 am to 6.0 pm. - opportunity to attendi all the course classes and concerts. - reduced prices in certain hotels. - opening-evening cruise-dinner and apéritif. - Possibility of attending (opportunity to attend) all the course classes and concerts. - Opportunity to work in the conservatoire studios, within the limits of available places, and to take one or two specific classes. - membership in the A.M.F.H : 15 Euros. - For any request for additional information an registration, send us an E-mail with your name (Stating) your instrument and approximate level (of standard of playing reached). We will send you a form to return to us, along with you "jpg" photograph (applied to both students and listeners). As soon as your registration is confirmed and after receipt of your deposit, we will propose a programme for you (as student) to prepare, and send you detailed information about the course and about Budapest. - The available places wil be taken up towards the end of mai, in order that we can propose to you the programmes for préparation. The number of places for pianists is limited. Nonetheless, once the quota has been reached, a programme for two pianos duos programs could be proposed for pianists enrolling on the course.